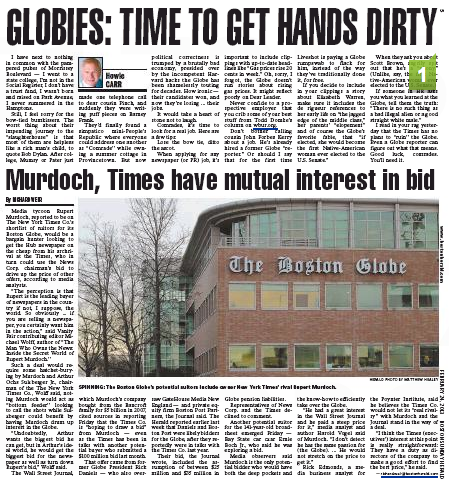 Media tycoon Rupert Murdoch, reported to be on The New York Times Co.’s shortlist of suitors for its Boston Globe, would be a bargain hunter looking to get the Hub newspaper on the cheap from his archrival at the Times, who in turn could use the News Corp. chairman’s bid to drive up the price of other offers, according to media analysts. The Wall Street Journal, which Murdoch’s company bought from the Bancroft family for $5 billion in 2007, cited sources in reporting Friday that the Times Co. is “hoping to draw a bid” from Murdoch — even as the Times has been in talks with another potential buyer who submitted a $100 million bid last month. 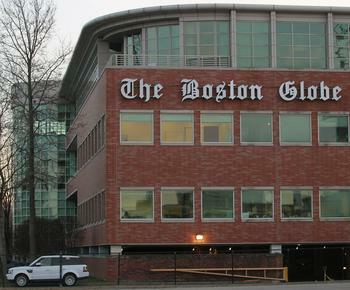 News Corp.’s ownership of a television station in Boston would rule out purchase of the Globe, given regulatory rules that prohibit companies owning a newspaper and a TV station in the same market, said a person familiar with the situation. But hey – why let facts get in the way of a good poke in the competition’s eye, eh? This entry was posted on Sunday, February 24th, 2013 at 7:23 pm and is filed under Uncategorized. You can follow any responses to this entry through the RSS 2.0 feed. You can leave a response, or trackback from your own site. Wolff is a lot of fun (and reptilian! ), but I don’t think his ability to read Rupe’s mind is superior to anyone else’s — even if he did spend some time with the genocidal old tyrant some years ago. Yeah, well, he’ll never believe that, Dan. Didn’t Howie go to UNC? It’s not like Dartmouth State, y’all.